SAN JOSE — Santa Clara County officials are firing back at critics who say their policy of not notifying immigration authorities when undocumented immigrants are released from their jails led to the release of a homicide suspect who had nine detention orders issued against him. Carlos Eduardo Arevalo-Carranza, 24, is suspected of stabbing to death Bambi Larson, 59, in her South San Jose home last month. On Tuesday, San Jose Mayor Sam Liccardo criticized the county’s policy of “ignoring requests” by Immigration and Customs Enforcement that inmates about to be released be held until they are picked up by ICE. But county officials said on Wednesday that federal authorities, not they, were to blame for Arevalo-Carranza’s release. The disclosure Tuesday that Arevalo-Carranza is in the United States illegally, and that the county jail ignored six requests by immigration authorities to turn him over — Los Angeles County received three other detention requests from ICE — has renewed criticism that “sanctuary” policies allow serious and violent criminals to slip through the cracks. Police arrested Arevalo-Carranza on Monday in connection to Larson’s killing. Larson’s body was found in her home on Knollfield Way on the afternoon of Feb. 28. ICE confirmed Tuesday that Arevalo-Carranza entered the United States illegally in 2013 and had been held at jails in Los Angeles and Santa Clara counties on a number of prior convictions, including drug charges, burglary and one felony false imprisonment charge in 2016. Fresno immigrant advocates believe a “long overdue” new advisory committee will make a dent on issues affecting the local immigrant community — despite having no funding attached. The Fresno City Council on Thursday unanimously passed a resolution to establish a 15-member immigrant affairs committee. The committee will be tasked with advising the City Council on issues related to immigrants, according to the resolution. In June 2017, the City Council turned down a proposal to establish a legal defense fund for immigrants facing deportation. The proposal asked for the city to include $200,000 in its 2017-18 budget for its contribution to the public-private legal fund that had been pushed by immigration and civil rights advocates. Some acknowledged that not having to make an upfront funding commitment for the advisory committee might have played a role in the unanimous support for Thursday’s resolution. Samuel Molina, state director for Mi Familia Vota, said he and others had been advocating for the committee for about a year and a half. “It’s long overdue,” Molina said. While he agreed that having no funding attached might have contributed to the passage of the resolution, he believes the committee can accomplish several things. For example, it shows the immigrant community that the City Council stands with them and takes their concerns seriously, he said. The committee has the potential to address several issues within the immigrant community, like transition into citizenship and language barriers. Plus, similar committees in other jurisdictions have shown to be effective. “Committees have worked to develop strategic plans on addressing immigrant issues and needs,” he said. Council Member Luis Chavez said the city has to start somewhere when it comes to communicating with the immigrant community and including immigrants in the city’s decision-making process. Each council member will nominate two members and the mayor will appoint one, Chavez said. 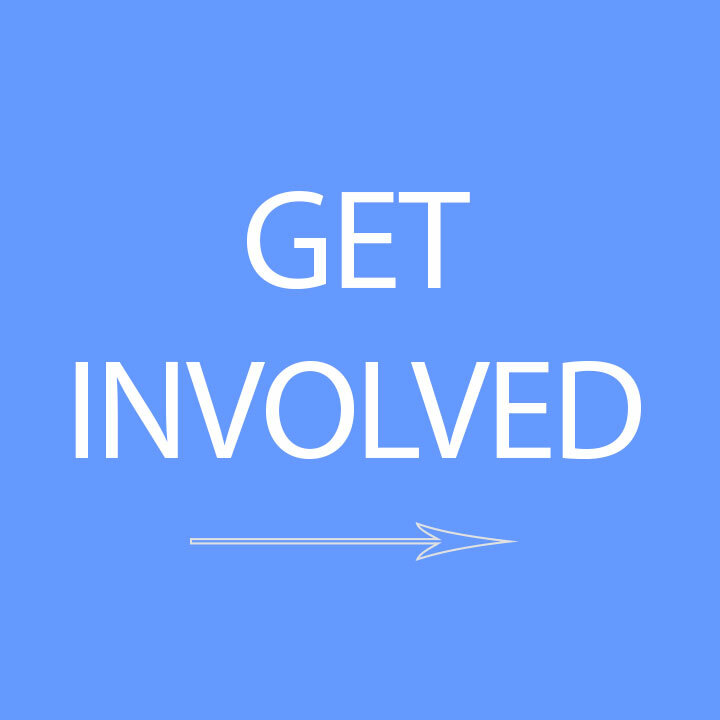 All committee members are expected to be in place by the end of March or early April, and the group will start its work soon after that. The committee’s meetings will be subject to the Brown Act and will be open to the public, according to the resolution. Eliseo V. Gamino, chair of the Central Valley Leadership Roundtable, said he hopes the committee will have resources and accountability. The committee should be based on assistance and in “helping keep families together” – a need that has recently been illustrated with the case of a Navy veteran who fears could be deported, Gamino said. But Gamino said the committee does need adequate resources to be effective. “It has to have appropriate resources and accountability goals to help families stay... together and avoid deportation without due process,” he said. Chavez said the committee will have city hall resources, as well as access to department heads, the city’s attorney’s office and access to his personal office. Issues the advisory committee can help address, Chavez said, range from long wait times for international flights at the Fresno International Airport due to an inadequate number of U.S. Customs and Border Protection officers, to offering English as a Second Language (ESL) classes and making citizenship classes more widely available. The legal defense fund is an issue the committee could bring back to the table as well, he said. Maricela Gutierrez, executive director with Services, Immigrant Rights and Education Services (SIREN), applauded the new committee. SIREN started the 2019 year in the immigrant and refugees rights movement with the federal government in a partial shutdown, where more than 800,000 federal workers were working without pay due to a failure between President Donald Trump and Congress to compromise over a useless and unnecessary border wall. And on January 25, after 35 days of the longest government shutdown in U.S. history, a budget continuing resolution was passed to open the government for another three weeks — without funding for the border wall. From the resistance by members of Congress who refused to give in to Trump’s border demands, a major theme rang true — immigrant voters helped put Congress in a position to resist this discriminatory and racist wall. For the November 2018 midterm elections, we saw record voter turnout among immigrants on the regional, state, and national level. Though SIREN doesn’t engage voters on behalf of candidates, we heard the frustration from voters in those districts where incumbent members of Congress lost. Our volunteers made more than 80,000 phone calls to Congressional Districts 10 and 21, who were represented by Rep. Jeff Denham and Rep. David Valadao, respectively, this past election. The number one concern voiced by immigrant voters was how Congress wasn’t doing enough for immigrants. From not protecting immigrant youth by failing to pass a clean DREAM Act to not pushing back against Trump’s draconian immigration executive orders, immigrant voters shared their disapproval for their members of Congress and their empty promises. As a result, the two incumbents lost their congressional seats this past November, along with other incumbents across the state and country. Since mid-July, Immigration and Custom Enforcement officials have been making arrests at Fresno’s courthouses, violating people’s right to due process and continuing to stoke fear within the immigrant community. It’s no coincidence that Fresno County is home to one of the fiercest in-state critics of California’s sanctuary policies, Sheriff Margaret Mims, who has proudly announced that her deputies and ICE have a strong working relationship. Though she claims that she is complying with state laws, the experience of community members in the Valley proves that there continues to be tight entanglement between her office and ICE. In our daily interactions with the immigrant community, providing legal services and know your rights trainings, we have heard more and more stories about a growing fear of contacting local law enforcement because of legitimate concerns of potential deportation. The Central Valley is being acutely impacted by Trump’s war on immigrants – so much so that my organization, the Services, Immigrant Rights & Education Network is poised to open a new office in Fresno due to increased demand. I have witnessed the plight of immigrants in our community firsthand since I was young. I grew up in the Fresno area as the daughter of immigrant farmworkers, hearing the stories of abusive employers and seeing my family and neighbors racially profiled by police and targeted by ICE. Now, as the executive director of SIREN, an immigrant and refugee rights advocacy organization, I’ve been connecting with many people who have been swept up by ICE in their brutal campaign. 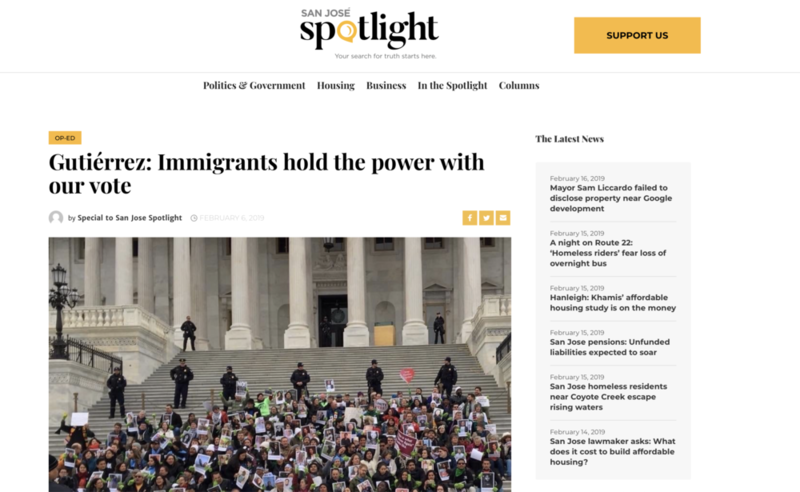 Services, Immigrant Rights & Education Network (SIREN) - Bay Area has spent the last several years building the political power of immigrant and youth voters with the aim of shifting the political landscape in the region and across the state. In 2018, we doubled down on our commitment to building this political muscle by registering more than fifteen thousand new immigrant and youth voters, contacting a hundred and sixty thousand already-registered voters, and mobilizing more than two hundred volunteers. In the 2018 midterm elections, our efforts helped generate one of the highest turnouts in state history for a midterm and resulted in the passage of critical local and state ballot measures, as well as the defeat of House members opposed to immigrant rights. One of SIREN's youth leaders, Miguel, participated in phone banking and door-to-door canvassing of Spanish-speaking voters. Although Miguel and his family cannot vote because of their immigration status, the day after the election he told us: "The community was my voice at the polls yesterday. Immigrants and youth came out and demonstrated our power in Northern California and the Central Valley. Through our voting power, we are passing policies in our state and region that are impacting our families, and we will carry our momentum into 2019 to fight for immigrant rights and protections for immigrant youth." While SIREN doesn't engage voters on behalf of specific candidates, we heard the mounting frustration from voters over the lack of action on immigrants' rights. Our volunteers made more than eighty thousand phone calls to voters in House Districts 10 and 21, which are represented by Rep. Jeff Denham (R) and Rep. David Valadao (R), and the number-one issue immigrant voters wanted to talk about was the fact that Congress wasn't doing enough for immigrants. From not passing a clean DREAM Act to not pushing back against President Trump's executive orders restricting immigration, immigrant voters shared their disapproval of the empty promises of their congressional representatives. Not surprisingly, Dunham and Valadao both lost. As we head into 2019, we have our work cut out for us. In 2018, SIREN opened an office in Fresno and established our immigration legal services, community organizing, policy advocacy, and voter engagement with Central Valley immigrant and youth voters. We know we have the political power and leverage to move Congress on issues like a clean DREAM Act and comprehensive immigration reform. And through our base-building work, we've built an infrastructure for and secured the trust of the community to lead outreach efforts focused on the 2020 census. It's critical that we overcome the many challenges and barriers to an accurate count and ensure that immigrant communities receive their fair share of funding. Beyond the census, we have momentum and the capacity heading into the 2020 elections to have an even greater impact. When we launched our campaign a few years ago, immigrant community leaders dubbed it "Votar Para Ganar" (Vote to Win), because that is our goal. With 2019 approaching, we are gearing up to win even bigger victories for immigrant and refugee communities in the state and to create a more welcoming California for years to come. Maricela Gutiérrez is the executive director of Services, Immigrant Rights & Education Network (SIREN), a nonprofit organization serving Northern and Central California that has worked on immigrant and refugee rights issues for more than thirty years. She was born and raised in the Central Valley. RALLY TODAY AND TOMORROW!//¡ACCIÓNES HOY Y MAÑANA! RALLY FOR IMMIGRANT & REFUGEE RIGHTS TODAY & TOMORROW! Stand with us to oppose the public charge rule, support the Refugee Caravan & denounce the detention of children! We invite you to join us for an action in front of the Federal Building to demand justice for the immigrant and refugee community TODAY 11/13 in Fresno and TOMORROW 11/14 in San Jose! Share our FB event & get others to join us! POR LOS DERECHOS DE INMIGRANTES & REFUGIADOS! ¡Únete a nosotros para oponernos a la regla de la carga pública, apoyar a la Caravana de Refugiados & denunciar la detención de niños! 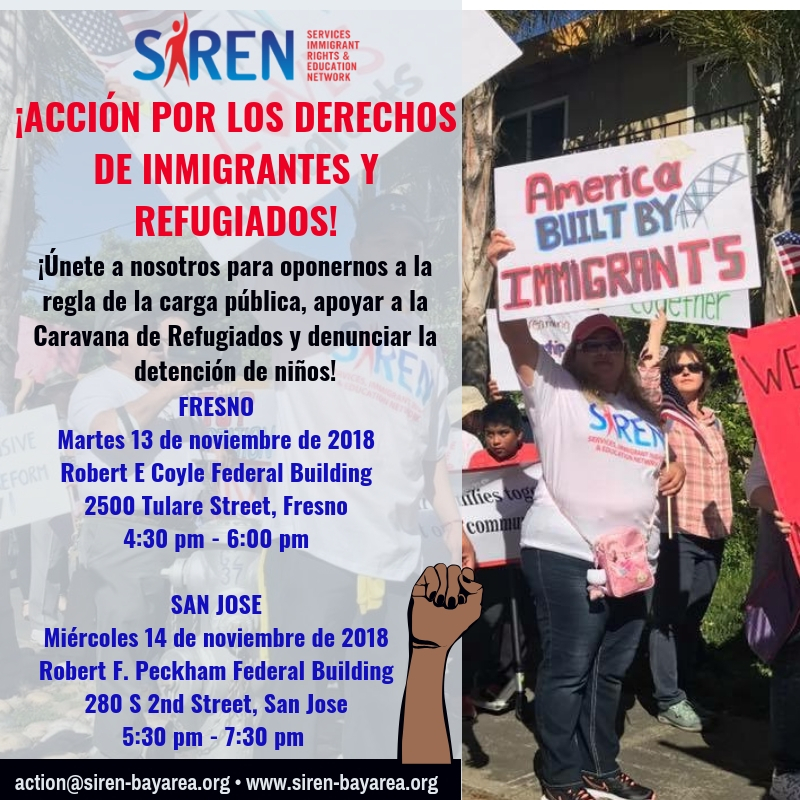 ¡Lo invitamos a unirse a nosotros para una acción en frente del edificio federal para exigir justicia para las comunidades de inmigrantes y refugiados HOY 11/13 en Fresno & MAÑANA 11/14 en San Jose! ¡Comparte nuestro evento de FB y consigue que otros se unan a nosotros! Donate to SIREN and give the gift of opportunity. The opportunity to LEAD. DREAM. VOTE. La Administración Trump está tratando de cambiar las reglas que aseguran que los niños inmigrantes y refugiados bajo custodia del gobierno sean tratados humanamente y liberados rápidamente. Seguridad Nacional quiere encarcelar a niños en centros de detención inhumanos hasta que se resuelva su caso de inmigración. Nuestro sistema de inmigración roto sigue devaluando las vidas de los niños inmigrantes y refugiados. Hoy debemos enfrentarnos al odio y al racismo en la defensa de los derechos de todos los niños inmigrantes y refugiados. The Trump Administration is trying to change the rules that ensure immigrant and refugee children in government custody are treated with humanely and released quickly. Homeland Security wants to jail children in inhumane detention centers until their immigration case is resolved. Our broken immigration system continues to devalue the lives of immigrant and refugee children. Today, we must stand up against hate and racism in defending the rights of all immigrant and refugee children.